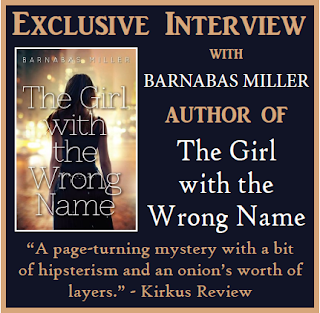 We're thrilled to have Barnabas Miller here to tell us more about his latest novel THE GIRL WITH THE WRONG NAME. Barnabas, what was your inspiration for writing THE GIRL WITH THE WRONG NAME? I think there are always multiple sources of inspiration when a story first takes shape, whether it’s something you read, or certain people in your life who’ve made an indelible impression, or a kind of story you’ve always wanted to tell. In this case, I will say that, while all of the above played a role, there was a member of my family whose real life experience became the seed for the story. I will leave it exactly that vague for fear of revealing too much! Once again, I’m compelled to answer without being too specific! (I often pause awkwardly at parties when people ask the standard conversational “what’s it about?” I really hate giving things away.) So, to answer far too generally, I think one of the greatest challenges in a mystery is to answer the big, burning questions without resorting to excessive exposition. There’s a scene in which Theo, our young hero, discovers a highly pivotal piece of info, and I was having a lot of trouble figuring out how to do it without people babbling on. I finally realized the best way to do that scene was to use a series of images that Theo discovers, and just let the description of the images tell her (and the reader) the story. How long did you work on THE GIRL WITH THE WRONG NAME? About two years, though there was a significant gap in the middle. It was a real pleasure to finally return to it and complete it. Good question. Tough question! Well, I know the old “never give up” cliché tends to run rampant here in ‘Merica, but I think I did learn a great deal about perseverance as both a person and a writer on this book. With every project I do, there is an inevitable moment when I am absolutely convinced that I must give up. The simple act of continuing to write, even while that moment is taking place, was extremely therapeutic, and an excellent life lesson. What do you hope readers will take away from THE GIRL WITH THE WRONG NAME? I fear this is another one where describing what I hope they’ll take away would risk giving things away! I know. Obsessive and neurotic. Theo was not created by sheer imagination alone. I know I’d like readers to come away with at least some recognition of their validity in the world—that people would actually care and notice if they disappeared. I hope readers might think twice about the impulse to isolate and alienate. Mostly, I’d just like them to feel they were entertained. That’s my primary goal here. I was very, very lucky in this regard. A writing partner and I had just published a Young Adult book that was nominated for an Edgar award (an award strictly for mysteries). Right around that time, an editor I’d worked with was setting up a Young Adult imprint (Soho Teen) at a publisher specializing in mysteries (Soho Press). He gave me the opportunity to publish this book. There’s also a third category, and that is books I have written and published, but not under my name. It’s called ghostwriting, and I have done a lot of it. In this case, I think what sank in was a realization of what needed to be left out. I live very close to the World Trade Center in NYC, and after going through the experience of 9/11, I’d always felt compelled to tell a story related to that day. I still may do that in some other forum, but when my editor (gently) suggested removing that element from a very early version of this story, I realized how right he was. The weight of that day was not meant for this story, and once I’d let it go, I could really focus on this specific plot and these specific characters. I think that was the AHA! moment. I have tried it all. Music, no music, coffee shops, libraries, desks, beds, floors, standing, sitting, writer’s spaces away from home, writing at home, mornings, nights, and everything in between. At the end of the day, I have found that mornings, at a desk, in the home office is my best bet. I think I’d have to refer back to that point about perseverance. It’s not that you need the voice in your head to keep yelling, “YOU CAN DO IT!” in order to get it done. You just need to learn to keep typing while the voice in your head is yelling, “YOU MOST DEFINITELY CANNOT DO IT!” I’m still working on it. I’m working on a script right now. But if I were also working on a new mystery novel, I’d have to be very vague about it. Wouldn’t want to give anything away. Barnabas Miller has written many books for children and young adults. 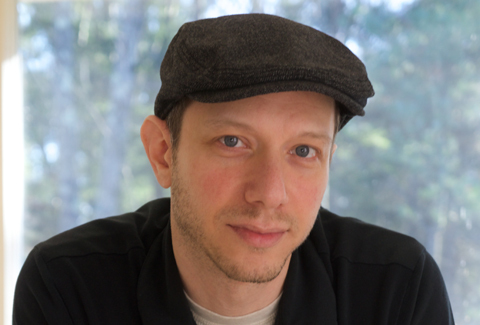 He also composes and produces music for film and network television. He lives in New York City with his wife, Heidi; their cat, Ted; and their dog, Zooey. 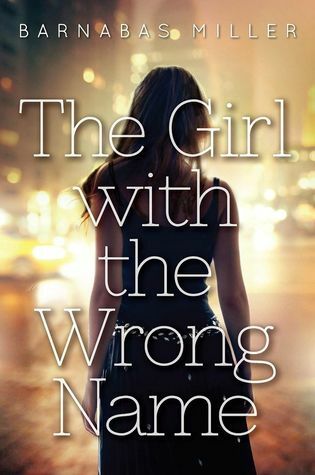 Have you had a chance to read THE GIRL WITH THE WRONG NAME yet? Do you have multiple sources of inspiration when a story is taking shape? Are you able to keep typing when the voice in your head is yelling bad things?